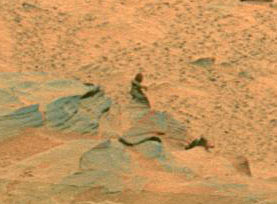 Much excitement is being had with this image, taken on Mars in 2004 by the Spirit probe. A small, irregularly-shaped rock, thrown into odd relief and casting a shadow, it forms an interesting simulacrum. Many are calling it "Bigfoot on Mars", suggesting that it resembles the famous 1967 fake footage of the supposed American man-ape. Unromantic geeks! 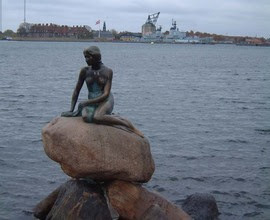 It's obviously the Little Mermaid.